Our story begins in the city of Caracas, Venezuela - a bustling hub of oil and commerce, and home to Jose Escalante. It was early in the mid-1960s that a young Jose Escalante met the man who later became his best friend, Gustavo Sandoval. 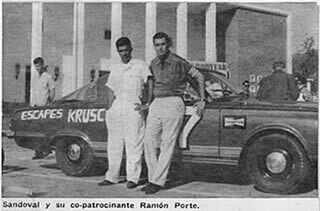 Both young men shared a passion for great cars, and Gustavo was already an engineer with Chrysler Venezuela. Jose was on his way to college, with dreams of working in the automobile industry. 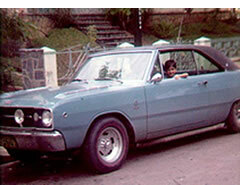 Jose had purchased his dream car, a new '68 383 Dart, but then sold it and banked the money as he headed to college. During the late 60s, Chrysler asked Gustavo to transfer to Detroit. It didn't take but a few months before Gustavo convinced Jose to follow him and his family to the Motor City. The siren call of Woodward and Gratiot Avenues were too much to resist! It was the fall of 1969 when the Escalante family arrived in Michigan -- Jose, his wife, and their two young sons, Juan and Gustavo. Having fallen for Mopars earlier in his life, a visit to the annual auto show at Cobo Hall in the fall of '69 was a must-see activity for Jose and the family. One look at the all-new '70 Challenger on display, and Jose knew exactly where to spend the money he had saved from the sale of his '68 Dart. 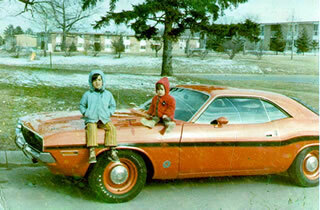 On December 12, 1969 Jose brought the Hemi Orange Hemi Challenger home from its spot at Detroit's Northwestern Dodge. With gas cheap and plentiful in the early 70s, the car was used for daily transportation for the Escalante family. 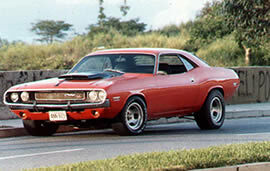 In the months to follow, as Jose fell in love with the styling of Dodge's Challenger T/A, a T/A hood, rear window louvers, rear spoiler, ET-III wheels, 4.10 gears, and Rat Roaster intake all somehow found their way onto the car by now christened El Hemi. Most of these bolt-on pieces came courtesy of Gustavo Sandoval and his connections with Chrysler suppliers. In 1972, Jose and the family headed back to South America as the result of an offer from Chrysler's purchasing department in Venezuela. After tanking up on Sunoco 260, and stocking the trunk with 2 cases of Pennzoil racing oil, El Hemi was loaded onto a freighter in Miami for the trip to Venezuela to join the rest of the family. Street racing was big in Venezuela, and Jose wanted to be prepared. Once word of the arrival of El Hemi spread, very few were willing to risk losing face by losing a race. The few that did paid for the privilege as many dollars changed hands. Very soon, El Hemi was enjoying daily drives to work with Jose, until it was parked in 1980 in preparation for revitalization. El Hemi had 58,000 miles on the odometer. Parts availability problems in Venezuela kept Jose from being able to complete freshening the engine up, so the car remained parked for four long years. In 1984, Jose's son Juan was finally allowed to drive the car he had dreamed about, but only for a short time. It was then permanently put in storage where it deteriorated over the next 10 or so years. 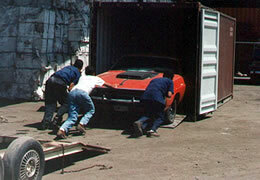 In 1995, brothers Juan and Gus engaged in a quest to bring the car back to the US for restoration. Although it took them well over six months of jumping through hoops and dealing with bureaucratic corruption to finally get the car on a container ship and out of Venezuela, El Hemi is now back home for its rebirth. 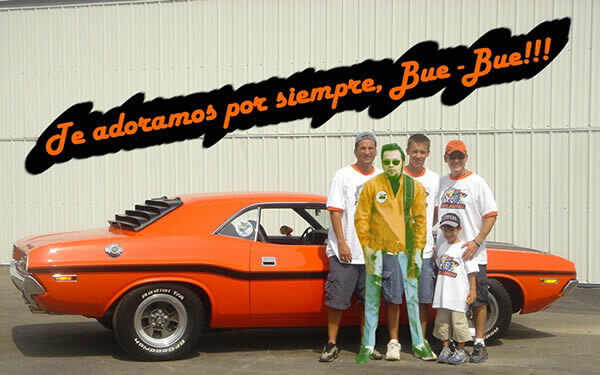 In the spring of 2002, brothers Gus and Juan flew their dad from Venezuela to the US to help deliver El Hemi to Rick Kreuziger (RestoRick) in Wisconsin. Rick, known as the Mopar Doctor, worked diligently to restore El Hemi back to life. With the restoration completed in 2005, the orange Hemi Challenger 4-speed is once again terrorizing the streets and adding to the legend of El Hemi! Copyright © 2003- The Escalante Family. All Rights Reserved.